About the Book: In A SEA OF SHIELDS, Gwendolyn gives birth to her and Thorgrin’s child, amidst powerful omens. With a son born to them, Gwendolyn and Thorgrin’s lives are changed forever, as is the destiny of the Ring. Thor has no choice but to embark to find his mother, to leave his wife and child and venture away from his homeland on a perilous quest that will have the very future of the Ring at stake. Before Thor embarks, he is to unite with Gwendolyn in the greatest wedding in the history of the MacGils, and he is given the honor he has always dreamed of when he is inducted into the Silver and becomes a Knight. Gwendolyn feels a looming danger to the Ring, and furthers her plans to rescue all of her people in the case of a catastrophe. Erec receives news of his father’s illness, and is summoned back home, to the Southern Isles; Alistair joins him on the journey, as their wedding plans are put in motion. Reece, despite himself, falls in love with his cousin, and when Tirus’ sons find out, they set in motion a great treachery. And Romulus, in the Empire, discovers a new form of magic which may just destroy the Shield for good. 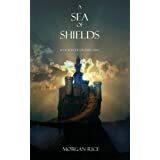 With its sophisticated world-building and characterization, A SEA OF SHIELDS is an epic tale of friends and lovers, of rivals and suitors, of knights and dragons, of intrigues and political machinations, of coming of age, of broken hearts, of deception, ambition and betrayal. It is a tale of honor and courage, of fate and destiny, of sorcery. It is a fantasy that brings us into a world we will never forget, and which will appeal to all ages and genders. My Review: In this episode Morgan continues this superb story. It starts with Gwendolyn giving birth to a boy. And still trying to pacify the Ring, Gwendolyn send Reece to the Upper Isles and he meets his old passion from youth, his cousin. Tiro's sons use that fact to prepare a treachery. In the meantime Thor leaves in a quest to find and meet his mother, while Erec is summoned to the South Islands, as his father is dying and Alistar goes with him. Packed with action, this book will keep you entertained for hours. And there is not an idle moment until you turn the last page! Get ready for another very entertaining episode of this incredible saga. You will not get tired of following Thor, Gwendolyn and all our heroes in this new episode. Just be aware that in order to savor every moment of this episode, I recommend that you start reading from the first episode to better understand the dynamics among the characters, as well as have a full idea on the environment of the story.